TGI-almost-F, everyone! I am so, so, SO excited to share this beautiful engagement session with you today. Last Friday, I met up with Christine and Stephen in Old City Philadelphia, where spring was everywhere: fresh green grass sprouting, new buds on the trees, birds chirping, and so many people out and about to enjoy the beautiful, sunshiny weather! It was ahhhhh-mazing. 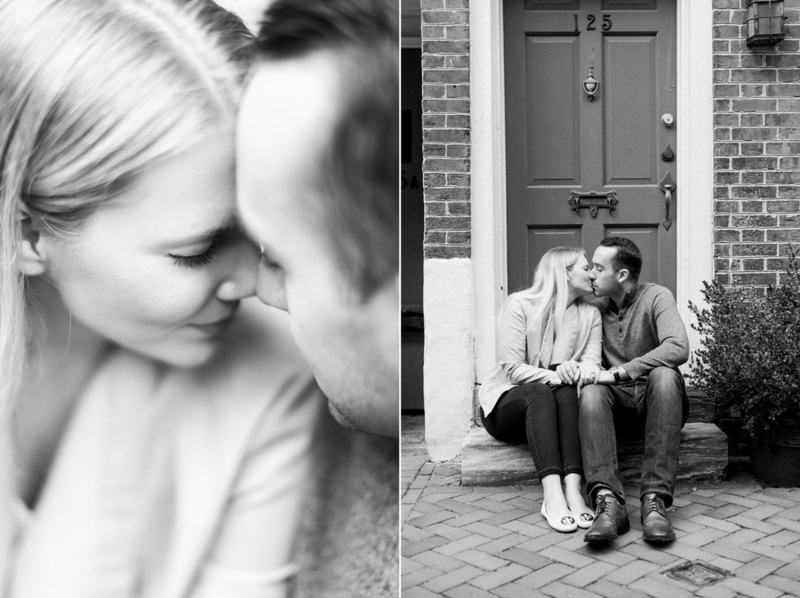 Christine and Stephen met their freshman year at Widener University and they never looked back! Stephen, an officer in the United States Army, recently returned from his deployment to Afghanistan, so what better way for us to celebrate his safe return than to document their love story?! It was so much fun spending my evening with these two! Christine and Stephen, I cannot wait for your special day!!! While strolling through Old City, we stopped in the cutest little coffee shop called Menagerie Coffee. If you're in the neighborhood, make sure you stop in! So many beautiful blooms everywhere we turned! For real, buds and blooms EVERYWHERE! Would you LOOK at the gorgeous sunset light that was peeking through the city buildings? !